Curator, Reporter: Stephen J. Williams, Ph.D. The advent of molecular targeted therapies like Imatinib (Gleevec), and other tyrosine kinase inhibitors (TKI) has been transformative to cancer therapy. However, as with all chemotherapeutics, including radiation therapy, the development of chemo-resistance toward personalized, molecular therapies has been disastrous to the successful treatment of cancer. 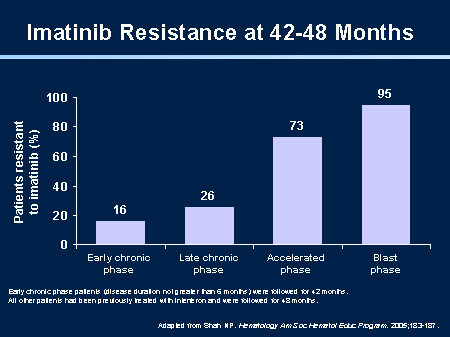 The fact that chemo-resistance develops to personalized therapies was a serious disappointment to clinicians (although most expected this to be the case) but more surprisingly it was the rapidity of onset and speed of early reported cases which may have been the biggest shocker. Selection and characterization of BCR-ABL positive cell lines with differential sensitivity to the tyrosine kinase inhibitor STI571: diverse mechanisms of resistance. Blood. 2000 Aug 1;96(3):1070-9. Mahon FX1, Deininger MW, Schultheis B, Chabrol J, Reiffers J, Goldman JM, Melo JV. Targeting the tyrosine kinase activity of Bcr-Abl with STI571 is an attractive therapeutic strategy in chronic myelogenous leukemia (CML). A few CML cell lines and primary progenitors are, however, resistant to this compound. We investigated the mechanism of this resistance in clones of the murine BaF/3 cells transfected with BCR-ABL and in 4 human cell lines from which sensitive (s) and resistant (r) clones were generated by various methods. Although the resistant cells were able to survive in the presence of STI571, their proliferation was approximately 30% lower than that of their sensitive counterparts in the absence of the compound. The concentration of STI571 needed for a 50% reduction in viable cells after a 3-day exposure was on average 10 times higher in the resistant (2-3 micromol/L) than in the sensitive (0.2-0.25 micromol/L) clones. The mechanism of resistance to STI571 varied among the cell lines. 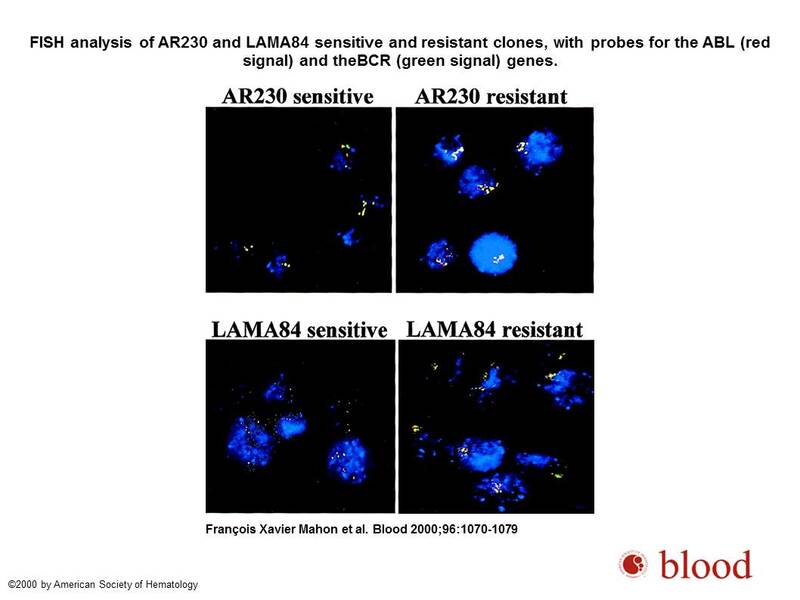 Thus, in Baf/BCR-ABL-r, LAMA84-r, and AR230-r, there was up-regulation of the Bcr-Abl protein associated with amplification of the BCR-ABL gene. In K562-r, there was no Bcr-Abl overexpression, but the IC(50) for the inhibition of Bcr-Abl autophosphorylation was increased in the resistant clones. Sequencing of the Abl kinase domain revealed no mutations. The multidrug resistance P-glycoprotein (Pgp) was overexpressed in LAMA84-r, indicating that at least 2 mechanisms of resistance operate in this cell line. KCL22-r showed neither Bcr-Abl up-regulation nor a higher threshold for tyrosine kinase inhibition by STI571. We conclude that BCR-ABL-positive cells can evade the inhibitory effect of STI571 by different mechanisms, such as Bcr-Abl overexpression, reduced intake mediated by Pgp, and, possibly, acquisition of compensatory mutations in genes other than BCR-ABL. FISH analysis of AR230 and LAMA84 sensitive and resistant clones, with probes for the ABL (red signal) and theBCR (green signal) genes. BCR-ABL is identified as a red–green or yellow fused signal. Adapted from Mahon et al., Blood 2000; 96(3):1070-9. 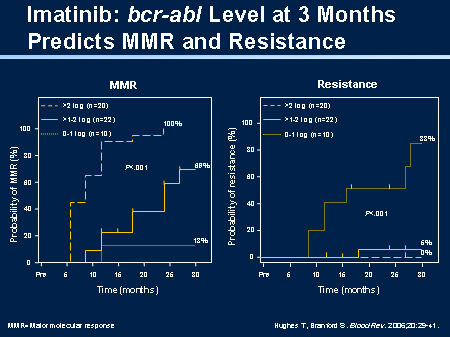 If you look at the accumulation of imatinib resistance to find if it is either initially not responding or becoming resistant after a good response, it goes up with type of disease and phase of disease. So if you look at patients who have early chronic phase disease — that is, they start getting imatinib less than a year from the diagnosis — their chance of failure is pretty low. With later disease — they are in a chronic phase but they have had disease more than a year before they get imatinib — it is higher. If you see patients with accelerated phase or blast crisis, the chances are that they will fail sometime in the future. Therefore, because not all resistant samples show gene amplification of Bcr/Abl and the rapidity of onset of resistance, many feel that there are other mechanisms of resistance at play, like kinome plasticity. Beyond gene amplification, other mechanisms of imitanib and other tyrosine kinase inhibitors (TKI) include alterations in compensatory signaling pathways. This can be referred to as kinome plasticity and is explained in the following abstracts from the AACR 2015 meeting. Occurrence of the BCR-ABLT315I gatekeeper mutation is among the most pressing challenges in the therapy of chronic myeloid leukemia (CML). Several BCR-ABL inhibitors have multiple targets and pleiotropic effects that could be exploited for their synergistic potential. Testing combinations of such kinase inhibitors identified a strong synergy between danusertib and bosutinib that exclusively affected CML cells harboring BCR-ABLT315I. 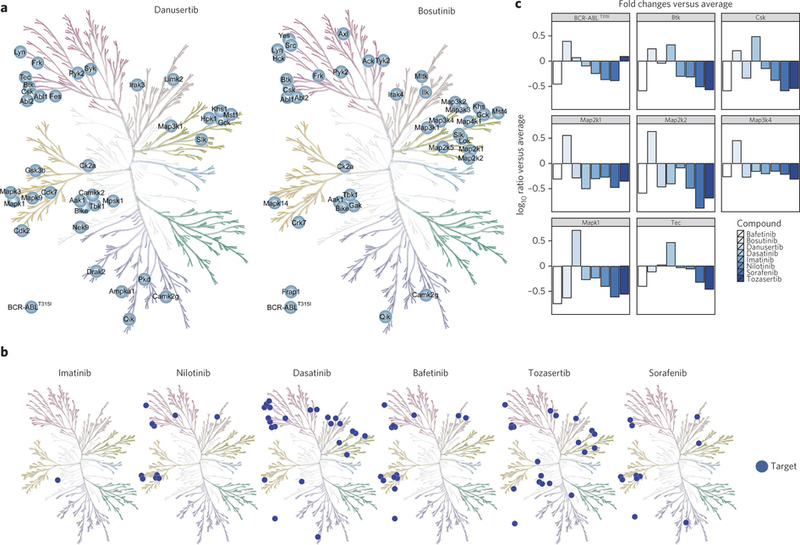 To elucidate the underlying mechanisms, we applied a systems-level approach comprising phosphoproteomics, transcriptomics and chemical proteomics. Data integration revealed that both compounds targeted Mapk pathways downstream of BCR-ABL, resulting in impaired activity of c-Myc. Using pharmacological validation, we assessed that the relative contributions of danusertib and bosutinib could be mimicked individually by Mapk inhibitors and collectively by downregulation of c-Myc through Brd4 inhibition. Thus, integration of genome- and proteome-wide technologies enabled the elucidation of the mechanism by which a new drug synergy targets the dependency of BCR-ABLT315I CML cells on c-Myc through nonobvious off targets.